“Seven extraordinary and diverse regional artists accepted our invitation to create work inspired by the show’s simple title; Sticks and Stones. No further instruction was given. 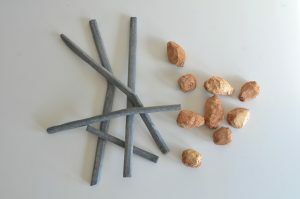 These sticks and stones could be used as materials, tools, subjects, inspiration or any combination of these. In mediums from painting to furniture making, from sculpture to photography, they have creatively and imaginatively embraced the directive”.